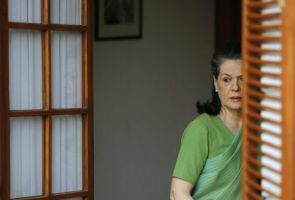 Congress president Sonia Gandhi Wednesday held consultations with senior party leaders, including A K Antony, as talks for an alliance with Jharkhand Mukti Morcha for the next Lok Sabha polls and formation of a coalition government in Jharkhand reached the final stage. Defence Minister Antony, who chairs the sub-group on alliances for the next general elections, AICC General Secretary in-charge of Jharkhand B K Hariprasad, AICC General Secretary Shakeel Ahmed, PCC chief Sukhdeo Bhagat and CLP leader Rajendra Singh met Gandhi this morning to apprise her of the progress of the talks with JMM so far. Earlier, Bhagat, Singh and senior state Congress leader Sarfaraz Ahmed met RJD chief Lalu Prasad. Singh said he was 100 per cent sure that the RJD would back the new government in Jharkhand. Congress has agreed to have a JMM chief minister in the state which in lieu has consented to give a lion's share of the 14 Lok Sabha seats to the Congress, sources said. Shibu Soren's son Hemant Soren, who is tipped to be the next chief minister, held a meeting with RJD chief Lalu Prasad last night to seek his support for the coalition government. Hours before his meeting with Prasad, Soren had a long discussion with Antony, the Congress president's political secretary Ahmed Patel where nitty-gritties of government formation were learnt to have been discussed. Sources said in the new government there would be no deputy chief minister, while Congress, which is participating in the government, could get five to six ministries. RJD is expected to get two ministerial berths while JMM will have to be content with the chief minister's post and four ministerial slots, the sources said. They said a coordination committee is expected to be set up and is likely to be chaired by a Congress leader. As part of the broad agreement over seat sharing for the Lok Sabha elections, the Congress is expected to contest eight of the 14 seats in the state leaving four for JMM and two for the RJD. President's Rule in the state will expire on July 17. The state had plunged into political instability on January 8 when BJP's coalition partner JMM, in a letter to the Governor, formally withdrew its support to the 28-month-old government pushing it into a minority. In the 82-member assembly, BJP and JMM have 18 MLAs each. The Munda government had the support of six members of All Jharkhand Students' Union, two of JD(U), two Independents and one nominated member who has voting right in a trial of strength. The Congress has a total of 13 members, Jharkhand Vikas Morcha(P) 11 and RJD 5. CPI-ML(L), Marxist Coordination Party, Jharkhand Party (Ekka), Jharkhand Janadhikar Manch and Jai Bharat Samta Party have one member each besides an independent. Congress, JMM to form alliance in Jharkhand?